Counted as one of the renowned manufacturers and suppliers, we are engaged in offering a wide range of industrial heavy duty floor coatings. Owing to high adhesiveness and optimum quality, these coatings are widely used in various heavy industries. These coatings are available in various textures and shades as per the demands of clients. 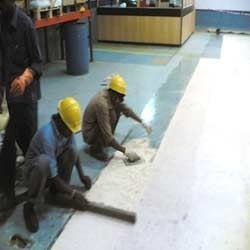 We offer our industrial heavy duty floor coatings at cost effective rates. Supreme Polytech Pvt. Ltd, have entered the new millennium with various grades of high performance Superdite the Versatile Epoxy Resins and Curing Agents for Epoxy Adhesive, Casting, Laminating, Tooling, Imitation Jewellery, Civil and Building Construction Materials, Industrial Floorings, Surface Coatings, Super-Dome Flexible system, Pigment Pastes (In Epoxy & Polyester) and also Super-coat the Polyurethane Refinish Coatings Systems and many new applications making use of these Superior- version epoxy hardeners & resins.